58.com, which is often referred to as China's Craiglist, is a winner on Wall Street. China has companies that compete with Google, Twitter, eBay and Facebook. So why not Craigslist? 58.com, the leading classifieds site for local merchants in China, made its U.S. stock market debut Thursday. And investors welcomed it with open arms. 58.com (WUBA) priced its initial offering of 11 million shares at $17. The stock, which trades under WUBA, surged more than 48% to above $25 a share. The company, often referred to as China's Craigslist, operates online marketplaces in 380 cities across China. It did become profitable this year, reporting net income of $300,000 on sales of $58 million in the first half of 2013. It posted a net loss of $30 million on sales of $87.1 million for all of 2012. The sizzling debut of 58.com is not a huge surprise. Chinese internet stocks have been incredibly hot this year. Shares of Baidu (BIDU), the Chinese search engine often compared to Google (GOOG), are up 90% this year. Baidu reported better-than-expected sales and earnings for the third quarter on Tuesday. Sina Corp. (SINA), which operates the Twitter-like microbloging website Weibo, has gained 63%. In April, online retailer Alibaba, often referred to as China's eBay (EBAY), took an 18% stake in Weibo. The deal valued Weibo at $3.3 billion. Twitter, by contrast, could have a market value north of $10 billion, according to securities documents filed last week. 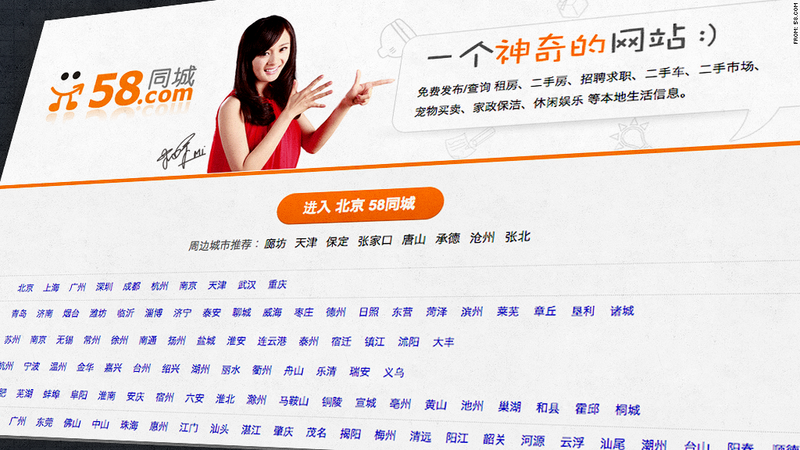 And Alibaba is gearing up for its own IPO. It's unclear if it will chose to list in Hong Kong or sell shares in the United States. Yahoo (YHOO) is a big stakeholder in Alibaba. 51job (JOBS), an online job search website similar to Monster.com (MWW), has surged more 60% this year. But there is one notable Chinese dot-com stock that's sitting out the big rally. Shares of Renren (RENN), the social network known as China's Facebook (FB), are down 3% for the year.